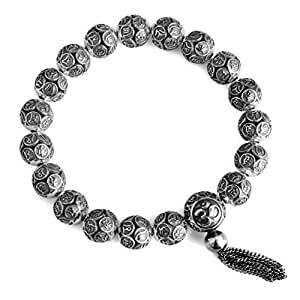 Metal ball : Sterling silver, Diameter 10mm&12mm(1ea), Weight 1.4g/per(10mm)&2.9g(12mm), The total weight of the bracelet depends on your options. Om Mani Padme Hum is engraved on each ball. It’s the most spiritual text of buddhist symbol. Length : Custom-Made at your request. Select the length option to allow for wrist size and fitting style. We suggest doing a comfort fit if you don’t have favorite style.